A little sun and everyone is out in their gardens getting things pruned, cut back, planted and dead headed. May is always one of the most colourful of months with so much going on and so many things to look at. Here are a few of my favourites that I rely on in my garden. A fantastic alpines that really packs a punch when planted in a container or the front of a well-drained border. It is easy to grow and needs little attention once established. I love its silvery sheened leaves that unfurl a bit like a fern and then the big fat flower buds that emerge. The straight specie is the most beautiful purple but if that does not float your boat, then there are also white and red forms. It loves the sun but can tolerate a bit of shade. My ones grow in a large alpine bowl and all I do each year is cut them back when they have died down. If we have a dry spell then I might occasionally water the pot and I feed it a couple of times a year with a good general fertilizer but that’s it. I adore this plant and love its tough, rough ‘I will grow’ attitude! This plant will grow almost anywhere in the garden and some say it can be a bit invasive but I love the way that it seeds about in the most unexpected places and these are often sites were others would not dare to grow! It will tolerate quite dense shade but can also grow in dry shady spots where others struggle. 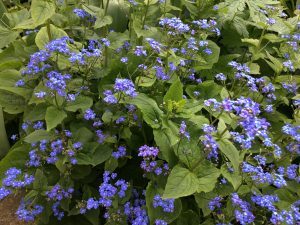 The rough leaves make great ground cover and the bright forget-me-not like flowers shine up well against them. Tough and reliable, if you are new to gardening then it’s a real star. A common spring flowering shrub that is ideal for a sunny or shady spot in the garden. It is a tough reliable shrub growing up to 2m (6-8ft). It does sucker about but this can be easily reduced to stop it taking over an area. The bold double flowers stand out if planted in the shade while in the sun they have a slightly orange tinge. 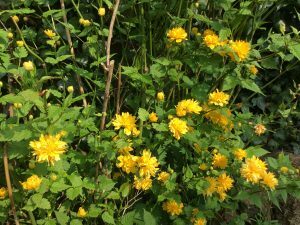 I find that it does well in drier areas and it is ideal for growing on banks or towards the back of a border along a hedge or fence where the soil can also be well-drained. You should remove several of the older stems in mature shrubs from time to time to encourage new healthy shoots which will flower well. A superb crab apple which has interest throughout the year. 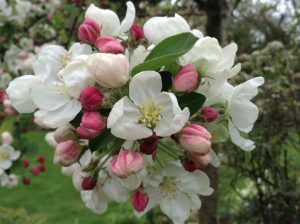 From the end of April until early May it has beautiful deep pink tinged buds that open up to pure white flowers which have a light fresh scent. 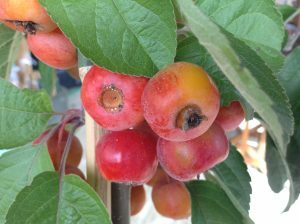 These are followed in autumn by small spherical fruits that are orange and red striped. It is a good tree for any garden as it does not get too tall or wide. The leaves turn a nice shade of yellow in autumn too. It’ll be happiest with good fertile and well-drained soil. This beautiful shrub or small tree is always a show stopper during May. The flower petals are actually bracts. It likes a cool root run and hates drying out in mid-summer and needs a good fertile but well-drained soil. 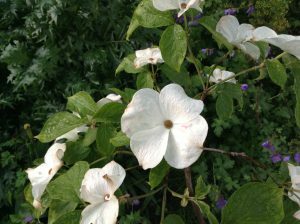 Growing it in semi-shade helps to reduce the risk of the bracts being damaged by the sun which can dry out the edges and cause brown tips. I have it growing in a pot which it does not seem to mind and seems to flower readily every year. As mentioned it hates to dry out and so growing in a pot can be risky but as long as it’s happy why not? I have far too many plants in pots in the garden but unfortunately working in a Plant Centre there are just so many things that you cannot live without and so pots are the only answer as my garden is full to bursting!! There are lots of Cornus that flower during May and early June. 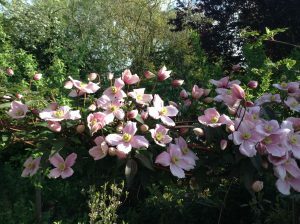 Other favourites are C. kousa var chinensis which has masses of white flowers, C. kousa ‘China Girl’ who’s bracts fade to pink as they age, Cornus ‘Norman Hadden’ which is a statuesque tree that is simply smothered in flowers which are followed by strawberry-like fruits and C. capitata which is similar but has more pointed leaves and needs more shelter from cold winds. A semi-evergreen shrub that always performs well in any soil. It flowers its socks off each year. It is a bit of a strange plant in that it has a lax habit and so will need some support. It grows very similarly to Coronilla but does not have the light primrose scent that Coronilla has. They are closely related and like a similar sight that is warm and sheltered out of the cold winter winds that we can get in this part of the world. 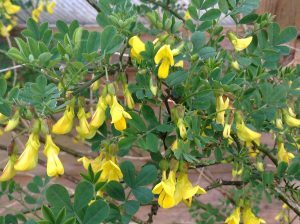 The golden yellow pea-shaped flowers are produced in masses and it flowers for about six weeks or so from May into June but can be as early as late April in a sheltered position. I have seen this grown as a wall shrub fanned out against the wall or up an obelisk as a centre piece to a planting scheme. If climbing plants are your thing then Clematis montana and all its different forms is something that you must have at least one of in your garden. Planting Tip: This is a vigorous climber that is ideal for growing through larger shrubs or trees to give them more interest in May or for growing over or up a building be it a shed, garage or just a pergola! I have C. montana var. rubens growing along chains with my rambling roses and it does very well. It has its roots in the shade of a large shrub and its flowers in the sun like all Clematis prefer. It is a rampant grower and so can be pruned to shape if needs be which promotes more side growths and therefore more flower production. They flower for about 4 weeks but are covered in masses of white or pink flowers depending on which one you grow. I like C. var. rubens as it has very dark foliage which contrasts nicely with the pink flowers. Other good forms are C. ‘Marjorie’ with its semi-double flowers with pointed petals in a metallic pink colour, C. ‘Elizabeth’ with its subtle faded single pink flowers and C. var. grandiflora with single pure white flowers. Dead Head Daffodils – Now that the Daffodils and Narcissus have faded it is time to remove the spent flower heads. Don’t cut back the whole flowering stalk just nip off the old flower and seed pod at the top of the stalk. This will allow all of the goodness in the flower stalk to be absorbed back into the bulb for next year. Allow the leaves to die back naturally, don’t cut the foliage off or tie them in a knot as this will reduce the plant being able to build itself back up to flower again next year. If you want to give them a hand and make sure that they will flower again next year then give them a good liquid feed once a week until the foliage starts to die back with something like a seaweed based feed, this will help to build the bulb up to flowering size again. Split Daffodils – If you have had clumps of Daffodils and Narcissus that that have not flowered this year (gone blind) then now is the time to dig them up separate the bulbs out and replant in groups of 3 to 5. This will allow the bulbs to grow to flowering size in the next year or so and you should have flowers in about two years-time. Feeding as above once split will help this. Sunday 13th May – Garden Open in aid of St Elizabeth Hospice 2-5pm. One of the best months to visit the garden and have a stroll around and enjoy it at its most colourful and raise money for a very worthy charity. 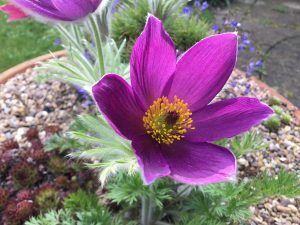 Sunday 3rd June – Garden Open in aid of St Marys Church East Bergholt 11am-5pm. This event is in partnership with several other gardens open within the village. Home-made teas available.